Mobile operator Three UK has today quietly removed the “Personal Hotspot” usage caps on their 4G mobile plans, which means that customers can now use all of their monthly data allowance to support Tethering (i.e. using your phone as a mobile broadband router for connecting other computers to the internet via WiFi etc.). Most operators tend to place restrictions on Tethering because they know that such users often make heavier usage than those who only use it for surfing the internet via a Smartphone. It’s easy to see why when looking at Ofcom’s own statistics (here), which last year found that the average monthly data volume per household on a fixed broadband connection was 190GB vs 1.9GB per SIM on mobile. The move may come as a pleasant surprise to some, although it was first quietly revealed back in August 2018 as part of the conclusion to Ofcom’s net neutrality linked investigation (here). Under the deal Three UK said they would remove several key restrictions from December 2018 “or earlier“. Clearly they’ve gone ahead a lot earlier (thanks to one of our readers, Blake, for spotting). * withdrawn restrictions on the use of handset SIMs in dongles and mifis. * allow customers on Essential Plans to tether on their current plan, or to migrate to the nearest equivalent Advanced Plan available at that time. We’ve been trying to chase Three UK’s PR team up about this all week but they’ve been rather vague in their replies, which is odd since the operator’s customer support staff in their high street stores were more than happy to tell us about the 4th October 2018 launch date. Everybody seems to know about it except Three’s own media team 🙂 . At this point some of you might well be asking: “Surely they can’t afford to do that on their ‘all-you-can-eat-data’ plans too?” The answer on this seems to be a little confused because their documentation says: “Even if you used your phone for every minute of every day you could only use, subject to TrafficSense™, around 1000GB each month. We may use this cap to identify inappropriate use of the service, such as commercial use, which isn’t permitted under our terms and conditions” (here). On the other hand the page linked above hasn’t, at the time of writing, been updated to reflect the cap’s removal and so it may change again in the future. In any case 1000GB is more than enough to make Mobile Broadband into a viable alternative to a fixed line broadband ISP connection, provided you get a good signal. Just take it with a pinch of salt until the operator clarifies any details. According to Three ‘s support staff, the roll-out of this change will be “slow” and so some of you with advanced plans may still see the cap being mentioned on your accounts but we’ve been told that it should be removed (i.e. by the sounds of it you won’t have to re-contract in order to benefit but we’re checking). We’ll ask Three’s media team, again, if they’d care to comment and see what happens. Just a quick update to clarify one point that some people seem to be confused about. The above article only refers to Tethering in the UK, it has no relation to roaming outside of the UK where different data rules apply as you are on a different operators network. The original Ofcom statement does mention roaming too and so far that change has not been implemented, but hopefully it will follow by Dec 2018. As a member of Three retail staff, I have been briefed that the uncapped tethering only affects those on 100gb tariffs and above. Customers on those tariffs will from today have their personal hotspot fair usage cap removed, there is no need to re-sign. To clarify above point, it only really affects customers on 100gb or Ayce data plans. This is due to the next data plan down offering 30gb which was the old cap limit anyways. My old AYCE package still lists Personal Hotspot in the My3 area? Still seeing Personal Hotspot in the My3 area on my old AYCE plan? Still seeing Personal Hotspot in my My3 area? Feel free to remove duplicates, comment didn’t show up straight away so thought it was filtered out. They’ve removed the Tethering allowance (cap), but it’s a slow roll-out so if you can still see the cap mentioned on your account then I’d wait until it’s gone before testing the water. Otherwise, as their website now says, “you can use all of your data allowance as a Personal Hotspot in the UK” (no caveat is mentioned for AYCE data but I am checking). I do not see them allowing people to tether an unlimited amount of data on their AYCE plan. Should i be wrong (i hope i am) i have just found my next broadband provider. I agree – remember their ‘One Plan’? I do (fondly). This was an AYCE data contract which was misused my many (I used less than 100Gb per month on mine). They terminated all One Plan contracts, starting with the highest users of data. They could not sustain tethering on AYCE back then so I do not see this being around for long now (if its true). I have been on all you can eat data plan for 6 years with different simcard, in any apple iPad it’s been used for me, my partner and kids you can add up to 5 devices on hot-spot, never had the 30gb ever gone down and we’ve regularly used 300+ each month in total never once had an issue, its like all devices connected just use the AYCE data not the hotspot data, crazy but true. The fact they have been for the past 8 years means nothing then? I understand that you can tether an “unlimited” amount of data with threes AYCE plan already. But you can’t do that the legit way unless you root or change your ROM. I can’t just activate hotspot as that would count towards the 30gb hotspot allowance. Plus three had these systems in place for a reason, to stop over use of their network. If they now feel comfortable removing those systems then i’m all down taking advantage now. The countless speed tests i’ve done on threes network don’t go below 40mbps. I get 5mbps with adsl. This would be a big help to my family of four. 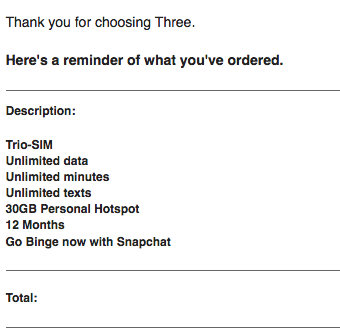 So Three are now offering 100Gb of data per month + unlimited calls & texts on a 12 month contract for £20 per month. Superb value and definitely a home broadband solution. I think its time for them to review their HomeFi package then which just offers 40Gb of data for £28 per month. They aren’t aloud to stop you using sim only plans for their mobile broadband. AYCE is £27 on 12 month sim only contract. I’d buy that then get my own 4g router. Although I am both happy and excited by this news. Three’s lack of spectrum may eventually bite them, but is that really a bad thing? Can Three then go to the courts or something and force ofcom to give them more spectrum to cope, and claim again that ofcom is not being neutral when it comes to dividing spectrum? I feel they have something up their sleeve with doing this and I cannot wait to find out what it is! This comes in on 1st of January officially. Be careful with usage before then as the slow roll out might not hit you straight away. According to Three it’s effective from today. I’m just repeating what the 3 store told me. It might be that it rolls out by area and January 1st is the date it rolls out in my area. Seriously contemplating an AYCE sim in their Home-Fi device. If I understand the changes, this should be perfectly within the terms. AYCE including all you can tether will only lead to one thing: Abuse. It’s human nature I’m afraid. People will cancel their home broadband connections in their droves (sometimes, 4G can be much quicker than fibre broadband), and rag their 3 AYCE for all it’s worth. If this truly does happen, it’ll all come crashing back down to earth soon enough. But hey. Maybe that’s the point. 3 are pulling a classic bait and switch. I doubt people with good home broadband services will just cancel and move to 3/4G. I am however considering it as my ADSL speed is only ~5Mbps. With FTTC enabled but not possible due to line length from the cabinet this is my only option (other than satellite). HAAHAH ONE PLAN again once everyone abuses data back to square one yet again send out letter getting the high user customer off the network or asking them to pay for a higher price plan. I got booted off the one plan in 2014 paying £15 with a letter telling me to pay £28 a month with 8gb hotspot limit they will now remove people that are paying under £20 and move them to the new plans in December £39. One Plan was only really an issue on 3G and the tether limit has been easy to bypass since then. 5G is not far off now any ways which should alleviate any capacity issues. If I didn’t have Virgin I would do that as FTTC as we know is capped to 80mbps and I get over 250mbps most of the time on EE even when tethering. This is good news, they may not have the speeds or network coverage like EE but you can’t beat them on price for data. If you only get a few mbps speed then not really a good deal is it? In reply to Simon, I get 0.75Mb/s ADSL broadband and currently pay £31 for £50Gb a month through Vodafone, so yes even if I only get 10-20Mb/s download with Three I would be happy to get AYCE data for that price. The only problem I see is when the minority abuse the service and it gets withdrawn again. I have just checked “three” website and all contracts on the website still mention the 30GB hotspot limit. Not on the mobile site. The limit has been removed. AKA One plan all again some users are paing £5- £15 will get booted off once again and moved to the £25 monthly plan. I don’t think they’ll do that again, lot more competition now and network congestion is less of an issue in most areas. Lol,three store staff Anyone paying £20 under will be moved to the new 12 months £39 unlimited everything plan or 1 month unlimited everything plan for £49. Nice three booting me off the network once again from the one plan 2015. No proof whatsoever, just like on HUKD, ‘James’. Take the AYCE, with 200 minutes. That will be £27 per month on a one month term. That’s exactly what I pay now. Not such the increase you’re shouting about. It’ll give me an excuse to go with EE if they do that. Three stopped unlimited tethering some years ago because of the strain on their networks. Ofcom poked around & forced them to bring it back. As a customer it’s great, but I have concern. Also this renders my Home-Fi [sort of] pointless now then! But I’m happy with AYCE everything! I have unlimited sim deal and I noticed at the end of August when we were on a caravan holiday the kids were using my hotspot for their tablets (heavy YouTube use) and I never used any allowance which I thought was odd but never looked into it further, could this be why? So ‘Phone’ sims can be used for a home internet connection. Does this apply to all providers? I’m looking for 2Mbps landline alternatives and I’d only been looking at the data sims under the assumption that they wouldn’t be selling a lesser product for more money unless they could actually enforce it’s use. If that’s not the case, that seems hugely misleading advertising. For 2mb/ phone mobile data sharing from three is good for your needs. That is if this type of speed is good for your home needs eg. Streaming at home. If not, your may actually need a good fibre optic package at home. I use my three phone data at home but it is not too good for streaming HD nor half HD. It is good for downloading to watch later or good old SD streaming where I find it perfect. This is tethering on the mobile phone. The providers can still detect and block other devices. If its just you then you can use your own phone but if there are others in the home you may wish to use a spare mobile. Performance will be limited to the phone chosen. Its unclear whether Three will block these AYCE deals from data devices such as MiFi or 4G Routers either now or in the future. The best home mobile solution is still a 4G Router cabled with an external antenna on the side of the house. As always check reception in the main places you use the SIM (home, train, office etc). Otherwise I’m looking at a nearly 4G tower serving a fairly rural customer base, so I’m guessing the speed will be miles ahead of any other option, even if it’s ‘just’ 20-30Mbps. Ofcom’s statement in the article specifically says that Three have removed restrictions from using phone sims in dongles and mi-fis. A phone sim in a mi-fi doesn’t do much without connecting other devices. As three don’t have a monopoly I was guessing the unrestricted use probably applied to all networks. Or are they just talking about specific restrictions? Hi I have a unlimite data in my three SIM only. Could someone help how I could connect my TV to my Mobile Wi-Fi to through away the home broadband which I pay as an extra. @parwiz. Hello! In settlings the is an option word something like Mobile & internet, In there will be tethering. Follow steps to open the menu. There you can rename the Wi-Fi name that your phone will show & also change the password. save it & switch tethering on. Then from your TV you find that WiFi network name and your in the password. >That is based on Android 8.0 steps. Pre 8.0 has an extra step. I’m still on the one plan which I’m pleased with but now this gives me more incentive to get a cheaper plan now would save me a few quid. Is this an attempt to refuge the number of customers? Subjectivity, my speeds London (East) are woeful, in on the verge of trying EE. There will always be people who abuse the service. I admit to being one of them. I live in an area that cannot get fiber broadband, and the only fast Internet I get is using my 3 phone. There are ways to get around the current capping of 30GB (I’ve used 86GB tetherong to my laptop so far this month and my 3 app still says I have 30GB). This is just a way for 3 to better monitor their customer’s data usage. I’m pretty sure the reason 3 removed the 30GB tethering cap on AYCE was because they can’t actually monitor it – so what’s the point of having it? 4G is being used more and more to provide single location broadband connectivity in superfast blackspots (the ever-widening coverage roll-out from all the MNOs has effectively killed the UK satellite broadband market stone dead except in the most extreme of circumstances). Having said that, although this will be fine while 3 still has underutilised capacity on its 4G network, there is no possible way it’s commercially sustainable long-term. So I’d expect them to get a reasonable rush of customers onto AYCVE, all of whom then promptly start using half a terabyte of data per month or more, which then slugs 3’s 4G network, which then leads to 3 rapidly changing its mind (again). This will not last long currently three network capacity hitting 70% @ peak times offering unlimited tethering we will guarantee a melt down at Christmas time. People already bypass the tethering caps .and have done for years .Three are getting very devious and have not looked after long standing customers . Hopefully they will start being more transparent .data has allways been over priced in this rip off country . I’ve been a customer for years. They have great customer service & offer discount & offers where they can. They are the cheapest of the four Mobile Network Operators for data..
I’m guessing you’ve not had a good experience with them? Order placed, unlimited on a 30 day contract for £32 a month, currently paying EE £60 a month for 200GB. We don’t have any other service available except ADSL which can’t even deliver 1 Meg some days, will be delighted if this works! When you ordered was it still showing 30GB hotspot allowance when added to the basket. I can’t seem to get the online shop to show that the 30GB limit doesn’t apply. Yes it was, but being mail order I’ve got 14 days to return it and its only a 30 day contract anyway, so decided to order anyway, the main page (which I’ve been watching) has certainly had the 30GB limit deleted from it. Just cancelled my 200meg virgin media £40 broadband. unlimited three sim only deal for £12 bring on the heavy data usage 2tb a month. Unfortunately three will cap it out at 1TB of data. So, if I sign up for 100gb a month at £20 can I then install the sim in a 4g router and bin btinternet? I can get 27mbps on Three, 1.8 on ADSL. Although no guarantee that your local mast can sustain current speeds if lots of people locally have the same idea with an all you can eat plan. So do yourself a favour and don’t tell all your neighbours! The Ofcom page only says that restrictions plural were removed, not that all restrictions were removed. It’s still all very unclear. Do ofcom mean all restrictions? Are Three talking about some legacy package that only includes voice minutes and not data? I am seeing ’30GB Personal Hotspot’ on mobile and sim only plans. Is this different to tethering? Personal Hotspot is the same thing as tethering. In the Offcom case notes about net neutrality it mentions EU regulations. Does this mean that next year when the UK leaves the EU anything will change regarding unlimited tethering as the same EU regulations will no longer apply to the UK? My understanding is that all current EU law has been adopted into UK law by ‘The Great Repeal Act’, it just won’t get updated going forwards, so it shouldn’t change. With Three’s Go Binge service, I tethered to my TV & watched Netflix in FHD/FULL HD 1080p. So my 30GB tethering turned into AYCE tethering. Other than using Google Play TV app, personally it’s not going to make much difference to me. I use 70-140GB of regular data on my phone a month anyway. Thinking about it, Maybe with more freedom my habits could change, watch less on the phone & more on TV. I have 29.9GB tethering allowance left according to the 3 app…. Tethered laptop to phone – downloaded state of decay 2 (29GB)…. This was using my razer phone and tethering using the Hotspot setting on the phone NOT a 3rd party app that hides tether usage. I am sure we have all been busy abusing our AYCE 3 plans over the weekend…. So just an update, I told my children that there was no need to ‘granularly manage’ the download of their outstanding XBOX games and to just go for it (Forza 2, 6 and 7 included among others), over 200GB later and in a pretty short time (normally would have taken days on the creaking ADSL) and the 30GB Tethering limit on my plan is still intact. ADSL Contract and BT landline notice served yesterday, just before I also received a quotation for FTTP of £8,100 + VAT. Goodbye BT….. for now???? Was this tethered or through a dedicated router? @EndlessWaves USB tethered via a phone connected to/through a USB 4G/LTE supported router. I have also conducted Wi-Fi Hotspot testing via the handset to other phones and tablets and the data limit post testing remains the same, it doesn’t deplete at all. I am not sure how the SIM would fare using a 4G/LTE Router and dedicated SIM slot although feedback would be appreciated if anyone is a position to test and supply the data accordingly. I have a small cluster of a rather expensive specific router for USB tethering but knowing whether dedicated 4G/LTE SIM supported Routers will also work would be beneficial. Update – for further testing I purchased a TP-Link MR200 today with dedicated SIM slot, thought it may be handier than USB tethering my spare phone through a 4G/LTE supported Router. A cracking little router it is too, not cheap but then again it does support 3G/4G/LTE. Well I have seen an improvement in signal and subsequent speed increase to 75Mbps from 45 – 50Mbps. I have pushed 85GB through it today (sorry neighborhood, then again I live rural, it’s mostly cows and sheep) and have used it to send and receive text messages too (from within the Router itself). I have checked my tethering limit and I still have the full 30GB available and although it’s not a dedicated Mobile Data SIM it isn’t fussy about being in the Router and clearly works just fine. Three haven’t removed the tethering 30GB section yet from my account but as it is an AYCE plan I expect to see that soon, then again if the tether value stays at 30GB unused then I really don’t care too much. I am not sure if the above helps anyone, but the future looks bright and it isn’t Orange! Are you still getting along fine with the Three SIM in the 4G router? My Dad just moved to a place that’s a long way from the exchange so thinking of doing the £20 AYCE phone SIM! Bit concerned tho as it’s a 12 month contract so very interested to hear how you or others that are using a dedicated 4G router are getting on. Happy Days kids – start your engines and get ready for a very heavy data fix!!! New Three AYCE card installed in my Huawei B310 router replacing my 40 gb data only sims. Two cancelled already, the contract for the third ends in Feb 2019. Looking forward to not having to change sims every 10 days and not closely monitoring our data consumption at home. Three mobile data sims have provided my rural broadband for three years now. VDSL failed to rise above 0.1 mbps on a good day, while ADSL delivers 0.25 mbps, due to less attenuation using ADSL. BT engineers express surprise I even get anything using VDSL due to distance and I tried ADSL at their suggestion. This is an absolutely fantastic move by Three. Speeds on 3g around 23mbps down and 4 mbps up. On 4g get about 17 mbps down and 10 mbps up. The mast is about 9 km away just slightly further than we are from the BT exchange (8.7 km). On the new AYCE my3 webpage, data shows as unlimited and details that you can use all of this in tethering. An ideal solution to rural broadband issues if you can connect to a mast. I use dual external (vertical & horizontal) antenna on the Huawei router – and these added almost 5 mbps up to the service on both 4g and 3g. Since Three started using 800mhz and VOLTE we are able to get reception inside our home. While these figures may be decidedly mediocre in other areas, for us, they are transformational. Have enjoyed Go Binge, but now looking forward to using other streaming services as well – instead of downloading to my Three phone and then casting to our TV. The net overall impact on Three will be minimal as streaming will tend to replace downloading on my phone. We get a more convenient service at a reduced cost – £25 pcm versus 3 40gb data sims at £51 (£17pcm each). The only downside to mobile broadband is the difficulty of monitoring isp cctv cameras on mobile networks from outside the local network. Workaround by using Teamviewer to remotely access a local pc and view the camera in that way. Well done and thank you Three – my rural broadband challenges largely answered. Did your AYCE phone Sim work in a 4G router then? AYCE Sim placed in my Three router (Huawei B310) and worked without any issues. The “Personal Hotspot” allowance images have been removed from the website now. Another happy camper here. Have put into use my Huawei b593 (which I bough last year but could not find a suitable sim only deal). My 3 ayce sim arrived at the weekend and went straight into the 4G router. Have linked that to my draytek which services my ADSL line and all is well. I’ve gone from 1.5meg on an ADSL line to currently 15meg from 4G. And the router is still sitting on the windowsill! I think I’ll get 40meg from our conservatory, just procured a 15m ethernet cable! I’ve been waiting 10 years for this. Tried some gaming last night and am getting similiar ping to the ADSL (50ms ish) and looked very stable too. My internet is so slow since the change. I was getting 20 mbps at least before but I am lucky if I get 5mbps now. Still shows 4g too. I have note 9, so fastest phone but internet so slow. My phone is hybrit model. So I also have o2 sim card in it and I get at least 20mbps with it. Why 3 slowed down? I only use about 5gb a month and on ayce contract. As expected, unlimited tethering has encouraged unashamed abuse of the network. I hope Three reintroduce tethering caps pronto. 4G was never intended for fixed broadband replacement. Those who rinse the cells by putting their SIMs in mobile routers and ruin the service for legitimate users should be permanently banned by Three. I think we could all see this coming – the first of a deluge of complaints? AYCE data for £27 per month is unsustainable. The 100Gb option for £20 is good value and would probably be ok for most users. How long before Three pull the AYCE option and move everyone to the lower limit? Those calling for a banning of unlimited tethering are missing the point somewhat – after years of tragically slow ADSL, where customers are getting a literal fraction of the speed that is either promised and being paid for alon* with customers getting far faster speeds, Three’s stance removing the 30Gb tethering limit is transformational. It will be very interesting to see what the take up is, eg £27 per month is exceptionally good value for say 40 Mbps when a BT customer is paying a little more for say 2Mbps. 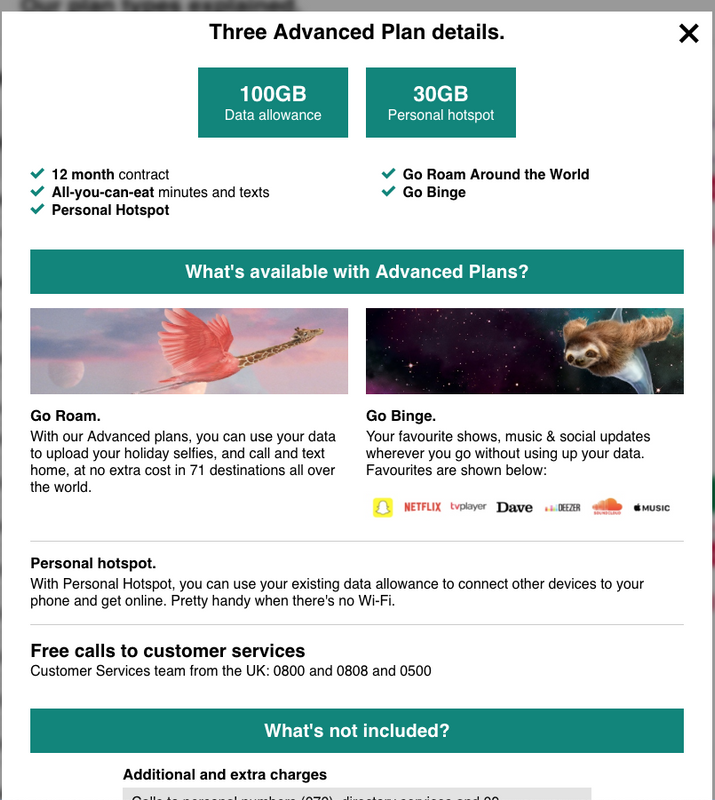 I suspect Three will sell a lot of these AYCE data plans as a result – in all seriousness they could have charged £50 a month and I’d still gladly pay it. The real issue is the total lack of investment from Openreach over many years to supply decent broadband speeds for ALL customers. Watching cabinets getting enabled to go to 330Mbps when they already provide 80Mbps whilst others languish on 0.5 Mbps – 2Mbps in the same area is a national disgrace. In the not too distant future there will be a viable market niche for some telcos to establish fixed wireless broadband (5G mmwave) providing hyperfast services for remote communities. In the meantime, I expect Three will be forced into using TrafficSense to isolate / throttle abusers and protect the network experience for everyone else. If you pay for ayce data, how is using it an ‘abuse’? Three agreed with Ofcom their customers could use the data they paid for in any device and that if you paid for the data you are entitled to use it in the terms of your contract. Ayce has always had limits for personal use and the 1 tb ‘limit’. Well done Three. So much speculated negativity – got to wonder why? Looking forward to Three’s plans for 5G and the development of a focus on home provision to rival fixed line broadband in many areas. It’s unlikely to hit rural areas for some time but it will be good for those in urban areas who struggle with poor provision. This guy talks a lot of sense. @tommy, would be very interested to hear your update once you’ve received and tested the sim and tethering. From most comments on the thread this 30GB appears no longer to apply, I was about to order the same Unlimited Black Friday deal. Your fine richard i been using my £12 ayce 600 minutes deal in my tplink router each month close to 1.5tb not one word from three. I dont really care if they cut me off i move over to virgin mobile £20 or £25 without a beat. @James, Thanks for the reply, appreciate the info and have just ordered the 3 deal. As tommy noted, it says 30GB Personsl Hotspot on the confirmation mail, but based on your feedback hopefully I’m all good and can use it to replace (or at least augment) my rubbish BT broadband (too far from the cabinet). Now need to select a 4G modem/router (don’t really need one with WiFi as already have a Google Mech system. Anyone been able to confirm if the limit has actually been removed for the unlimited blackfriday offer sims? Hope to get mine today. Thanks Dan – you are a star! I have an old (2 / 3 years?) monthly rolling plan with unlimited data for £15/m, with a Hotspot cap of 4GB since day 1. Just had a WebChat with Three, despite my online billing still showing Hotspot allowance of 4GB, they have confirmed that the Hotspot cap has been removed as with all unlimited data customers. Will find out this Xmas when I go to the holiday home without broadband! Bit confused -does anyone know if there is a european roaming cap on tethering still? Not unlimited roaming in Europe, I think it has just been increased a little, up to 19 GB a month IIRC. Just spoke with Three. Outside the UK the data cap (tethered or not) is 15GB per month, then charged at 40p per MB thereafter. Any updates on this from those who bought one? Can the Three AYCE SIM card be used in a 4G router? I’m presuming not but has anyone tried it? Living rurally and with just a 2.5 meg download from BT I decided to try the PAYG AYCE at £35 – activated on an unlocked phone and tested speed at about 20mb. Switched over to TP Link sim router and worked ok for 20 mins and then dropped to 2mb and really high latency. Switched back to an unlocked iPhone and back up to 20mb. Read somewhere about the carriers reading the router headers and throttling – any experience/advice?? You could try tethering with a combination of an old iPhone, usb lightning cable and Mac. This way your AYCE phone SIM is not breaking any rules and therefore shouldn’t be ‘throttled’ by Three. This way you can share the tethering via the Mac via WiFi and Ethernet cable. Which TP Link sim router are you using? I have a TP Link MiFi and it has always delivered much lower speeds than a Huawei Mifi unit, apparently due to its internal aerial being inferior. My phone always had a stronger signal than the TP Link unit. Not all are 4g and some seem to regularly fluctuate between 3g and 4g depending on signal strength. I now use a Huawei B310 router (provided by Three) with externally mounted aerials (H and V orientated) and have been able to restrict usage to only 4g signals. It delivers speeds about 3 times greater than my phone receives. Thx John – was also looking into connecting to an airport express to send around the house. Does anyone know if and when Three intend to implement unresticted tethering in the EU. I see the tethering cap has increased from 15GB to 19GB in the EU, is this as good as it is going to get ? 4G router working well with Three AYCE voice sim @ £27/month. Ranges from 20-75mbs download depending on the time of day. The kids have never complained! I used to use Vodafone 50GB/month mobile broad band SIM in a TP link 4G LTE router. I got fed up with vodafone and left hem. I now see 3 are offering unlimited Sim for £20/month – will this work in my 4G router or will it only work in a mobile phone? Yes it definitely works in a 4G router. Three have lifted the restrictions on which devices their SIM cards can be used in. I would recommend an external directional aerial too. Even better results. I have taken out a Unlimited data, phone & text sim from Three put it in my HUAWEI E5186s-22a 4G router and it works perfectly. I have BT fibre but our location means a max 15gb download 0.5mb upload. I am now getting at least 70mb download 30mb uploads. I have now ordered an exterior 4G Antenna so should get a faster connection or at least be able to move my router to a more convenient place so I can connect it to my fulled cat5e wired house. Very happy with this set up. The router comes with its own antenna which can be detached and an external antenna can be attached instead. The external antenna will give better results in terms of signal and therefore bandwidth. It could probably be used in a motorhome at 12V if you can find the right charger cable. I’m currently using P&G sim with ayce data in a router & it’s working perfectly. Is it likely to continue or is that the million dollar question? The reason I ask is because i’ve also an EE data sim with 300GB for £70.00 a month which for obvious reasons i’m considering cancelling. Thanks! Hi Guys – just purchassed a AYCE and a TP link MR200 (AC750) 4glte router. Th erouter takes the larger sim but it says No Simcard please insert your sim. I can’t test it as my other devices are nano….Any ideas? You can buy an adapter to convert the nano to a full size sim.